This was to be the first visit to my hometown in 2014. I decided to book on a KaSRTC Airavat Club Class for my return - booked the tickets towards the end of December 2013 itself. I had not taken a call on what bus to book for my outward journey. I was in confusion for quite some days. Soon after January 1, I decided to take a call - it was Kerala SRTC's new Super Deluxe for the trip! I selected the 11pm Bangalore-Thrissur Super Deluxe, via Mysore, Gudalur. I tried selecting the second row seat, but for some reason the row was showing up as "Ladies only". So I shifted to the third row - and booked Seat #9. The total fare worked out to Rs. 515 (Rs. 485 base fare plus Rs. 10 for reservation and Rs. 20 for online booking service charge). The first long trip of the year. I was curious and excited for sure. I was a bit tensed too - will it be comfortable and will it reach on time? I reached home on time, got ready and was set to leave. My brother dropped in at Jayanagar Bus Station by around 2130hrs. I waited there for a bus until 2200hrs - but none turned up. Since I did not want to miss the bus, I decided to take an auto instead. The driver said "meter-and-half" before starting - as I agreed, he started the meter, and got off the mark. It took about 20 minutes to reach Satellite - the driver was quite sane - no rash driving, and he did not jump signals anywhere. At the end, my wallet got lighter by Rs. 150 - no protests because he atleast had the courtesy to switch on the meter. Mysore Road Satellite BS (curiously abbreviated as "MCTC") was awfully crowded. Since the festival Pongal was around the corner, buses to TN were packed to the core. The bus station reflected the chaos - with long holidays for educational institutions, the crowd to Kerala was no less either. Buses were just coming in, getting full and moving out. While waiting there, saw a Super Fast to Kozhikode and Super Express to Thalassery headed out to their destination. 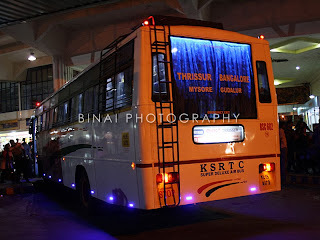 There was on TNSTC bus to Ooty and a couple of KaSRTC Rajahamsas to Kozhikode as well. Around 2235hrs, my bus was brought in. It was RSC682 of Thrissur that was doing the honours that day. Soon after the bus was parked, people mobbed around - the conductor had a tough time checking each ticket and letting people in - wonder why people get so impatient - the bus leaves only at 2300 - why should they mob like this? I waited till the crowd settled, and got in after some time. The conductor checked my ticket - did not ask for an identity proof. My first observations - the gangway is quite narrow. The vertical support bars made things difficult. Walking in with luggage is surely difficult. The seats looked good. The leg space - adequate. I did not hit my knees on the seat in front, but for some reason, I did not feel very comfortable. Some melodious Malayalam hits were being played. The crew had installed the music system by spending money from their pockets - they had also decorated the bus with stickers, led lamps and some plastic flowers. I noticed that seat numbers were stickered behind each seat - that is confusing. They could've stickered on the overhead racks instead. I settled on the seat till the crowd of people boarding the bus reduced. After that I got off the bus, took some snaps and got set for the journey. We were waiting for one passenger to turn up - the driver and the conductor tried calling the number provided during booking, but there was no response. Around 2255, the conductor went to their office and got the waybill signed off. We waited till 2303 - and started off. While backing out, the conductor called their office and informed that we are leaving, and gave the details of the passenger who did not report. The bus was full - all 39 seats were sold. Two extra passengers were also taken (actually two passengers were to board from Mysore - so the conductor took two extra seats from Bangalore). Once on the road, our driver meant business. I closed the curtains and tried to catch up some sleep - but the songs being played and the cabin lights wouldn't let me sleep. Finally, as we crossed Kengeri, the music system and lights were switched off. I dozed off afterwards. But everytime we hit a speed breaker, I woke up. The driver was typical KeSRTC styled - absolutely no respect for speed breakers! He'd brake only after we reached near one - and then jumps over. Somehow managed to sleep for sometime. As were entered Mysore, the conductor called up the passengers who were to board here - it seems he had called them earlier as well. The bus did not go to the bus station, but instead picked them. I did not understand where we were - but left soon after pickup (at 0134hrs) - 2h31m for Bangalore-Mysore! The bus can be aptly called "lights on wheels". 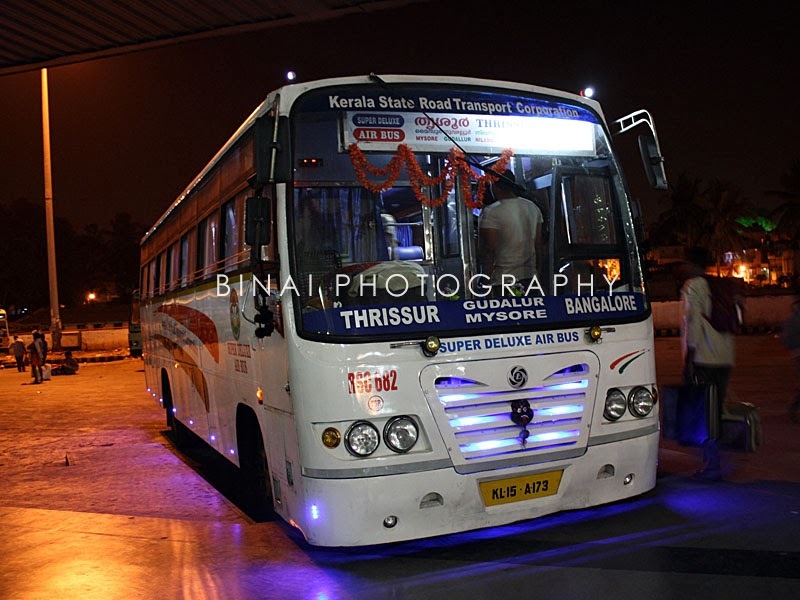 The bus was fully decked up with LED lights. I slept fairly well after Mysore. The road, I guess, was in good shape. I woke up when the bus stopped somewhere - it was Hotel Surabhi, at Gundlupet, at 0230hrs. To make matter worse, a guy from the hotel came in to the bus and started shouting, "Tea Coffee last break" etc etc. He kept shouting till everyone in the bus woke up. I got off the bus, took a stroll and remained outside. It was damn cold outside. The crew returned quickly, and we started off at 0240hrs. I decided to remain awake for some more time. We reached the Bandipur forest Check post gate at 0300hrs. They have tied a rope across the road, and kept some barriers around to prevent the vehicles from parking near the checkpost. As we reached this place, the conductor got off the bus, and untied the rope. As the bus passed through, the rope got entangled at the rear portion of the bus, and we pulled out the barricades. The driver quickly stopped. The conductor removed the rope and cleared way for the bus to move forward. We went through the checkpost. In the meantime, the lone forest guard on duty at the checkpost came out and started shouting at our driver. A few drivers (of the vehicles which were parked there owing to road closure) came and supported the guard. They started saying the driver was overspeeding, he hit the barricades because he could not control the bus, blah blah. Passengers from our bus also got out, and some verbal fights ensued. The guard put his foot down saying that he cannot let our bus pass, and he'll permit us only after his "saheb" comes. Our crew were in no mood listen - they put their foot down as well, saying ours was a bus with a valid forest permission to pass through at night, and we hadn't caused any accident as the people there claimed. In the meantime, the conductor signalled us to get into the bus. He went to the checkpost and signed in the vehicle register. We finally started off from the check post at 0306hrs. Once in the forest, it was just us - no other vehicle is permitted inside the forest between 9pm and 6am, other than two buses each run by the STUs of Kerala, Karnataka and Tamilnadu. Ours was one of the 6 buses that goes through the forest at night. Inside the forest, we crossed the Kottayam-Bangalore Super Deluxe. We passed the Karnataka state border some time around 0330 - the conductor had to sign an exit register there. Once into TN, the roads worsened - roads were awful in TN. They were inexistent at places. We finally reached the Mudumalai forest exit gate at 0400hrs. Things were quite interesting here - the entire road was blocked by vehicles who were waiting for the gate to open, and there were people sleeping on the road! The conductor got off - he went and woke up the people sleeping on the road, and got some vehicles parked on the road side. It took us about 5 minutes to clear the road. Spotted our pairing bus waiting at the check post. I slept off after the checkpost. I had a very nice sleep after that. I was woken up by the cacophony of deafening alarms going off in the bus. It was around 0530~0545 then. My co-passenger received a phone call then, and from his conversation, I understood that we were past Pandikkad then. We pulled into Perinthalmanna bus station at 0600hrs - sharp! Some 20 passengers got off there. The crew got off and went to the Station master's office. Announcements were made on the PA system about our bus. About 5 passengers got in as well. We left Perinthalmanna at 0628. I slept off again. Vaguely remember the bus stopping somewhere in between to drop passengers - but I did not notice where we were. We stopped at Shoranur at 0715. I slept off again. I woke up only when the conductor called a few passengers to alight - we were in Mulagunnathukavu then. I woke up, and straightened the back rest. We passenger Thrissur Swaraj round, and finally reached Sakthan stand at 0758hrs. I got off here - ending an 8h55m journey from Bangalore to Thrissur. I walked into the bus station, and took a KeSRTC bus to my hometown. 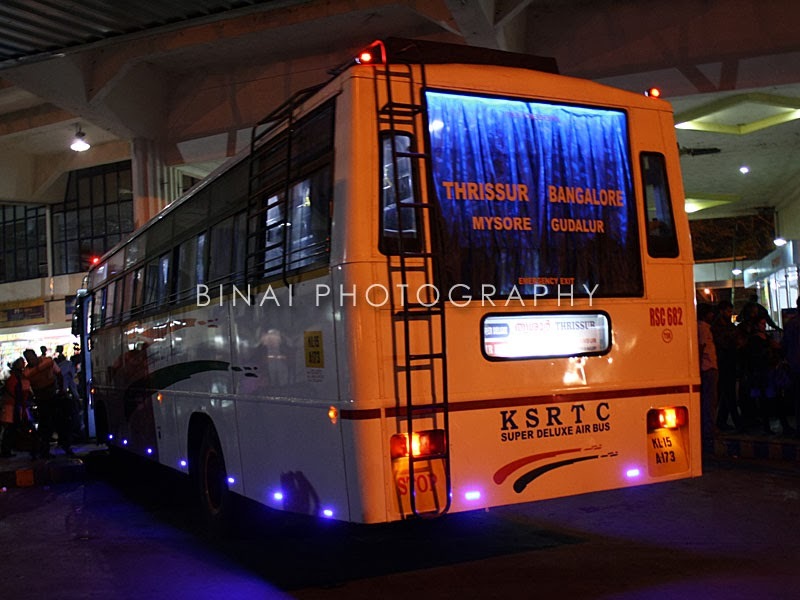 Ending remarks: The bus, RSC682, KL-15-A-173, is a recent addition to Thrissur depot's arsenal. The bus was in fairly good shape - the maintenance was really good. The body building quality was poor - there were lots of rattles coming in. The seats were not great - they seemed to be refurbished seats, and not new ones. The seats bore "Haritha" markings. The driving was typical KeSRTC style. The crew had installed a higher tone horn as well. The music system is a welcome addition, but its use needs to be regulated. They started playing songs as we left Perinthalmanna, at 0630 in the morning. Most of the long passengers were sleeping them. That could've been avoided. The crew did not take any additional breaks anywhere. The crew were well behaved. They rose to the situation when two people came requesting for seats in a fully booked bus - they were permitted to travel in the Cabin, with legitimate tickets of course. The journey time was amazing as well. Will I take this service again? Sure. Its a cheap option of travelling to Kerala. I only wished the bus leaves a little early and reaches Thrissur by, say, 7 AM or so. 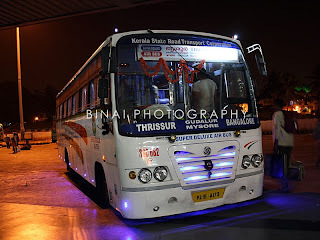 Before Kerala Lines came and also during late 2013,I took these DLX buses some six times(TVLA/KTR) but did not feel very comfortable for some reason-like the same as you mentioned in this post-think its due to my craze of Volvo travel with less jerks and road noises! Quite agree with you. The driver cabin is a show piece - they did not bother closing the door in my journey too. Another -ve i felt was the songs played in the driver cabin - since the door is open, everyone in the bus hears the songs and it disturbed my sleep badly. The curtains in the bus I travelled were good - so no complaints about that. The crew were great. May be as you are, I am also spoilt by Volvos. The seating in this one was quite awkward. Need to try out the TATA ones to see if the leg space is any better. Interesting A couple e of years back I had taken the same Super Deluxe. At that time there was no permit for this bus to cross the check post. Finally got caught up in the onam traffic and reached Trichur at 12.30 in the afternoon!!! Very useful. I am travelling in the same bus to Perinthalmanna this saturday . Hope I will have a good experience.